Neurodegenerative diseases are conventionally demarcated as disorders with selective loss of neurons. Conventional as well as newer molecules have been tested but they offer just symptomatic advantages along with abundant side effects. The discovery of more compelling molecules that can halt the pathology of these diseases will be considered as a miracle of present time. Several synthetic compounds are available but they may cause several other health issues. Therefore, natural molecules from the plants and other sources are being discovered to replace available medicines. In conventional medicational therapies, several plants have been reported to bestow remedial effects. Phytochemicals from medicinal plants can provide a better and safer alternative to synthetic molecules. Many phytochemicals have been identified that cure the human body from a number of diseases. 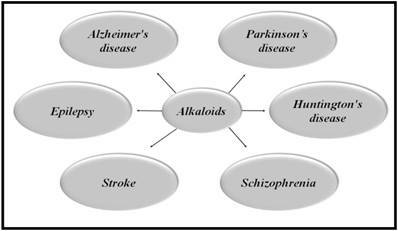 The present article reviews the potential efficacy of plant-derived alkaloids, which possess potential therapeutic effects against several NDDs including Alzheimer's disease (AD), Huntington disease (HD), Parkinson's disease (PD), Epilepsy, Schizophrenia, and stroke. Alkaloids include isoquinoline, indole, pyrroloindole, oxindole, piperidine, pyridine, aporphine, vinca, β-carboline, methylxanthene, lycopodium, and erythrine byproducts. Alkaloids constitute positive roles in ameliorating pathophysiology of these illnesses by functioning as muscarinic and adenosine receptors agonists, anti-oxidant, anti-amyloid and MAO inhibitors, acetylcholinestrase and butyrylcholinesterase inhibitor, inhibitor of α-synuclein aggregation, dopaminergic and nicotine agonist, and NMDA antagonist. Keywords: Neurodegenerative diseases, Phytochemicals, Plant derived alkaloids, acetylcholinestrase, butyrylcholinesterase, monoamine oxidase. Neurodegenerative diseases (NDDs) are the disorders of nervous system and are conventionally demarcated as a selective loss of neurons. Studies demonstrated that physicochemical properties of proteins are altered that cause deposition of these proteins in the human brain leading to neuronal degeneration . NDDs are cureless till date and are significantly increasing the mortality and morbidity rate in the developed countries and same scenario is expected in the developing countries as the information pile up [2,3]. Neuropsychiatric and neurological disorders like schizophrenia, depression, anxiety, Alzheimer's disease (AD), Parkinson's disease (PD), Huntington's disease (HD), Amyotrophic Lateral Sclerosis (ALS), cerebrovascular impairment, seizure disorders and head injuries are the major health issues along with other systemic disorders like cardiovascular, respiratory, renal, gastrointestinal and many others in the 21st century . The available remedies against NDDs are solely based on the management of these diseases but actual treatment is yet to be explored. There are several NDDs with similar symptoms but have different mechanisms of pathogenesis [4-6]. AD is one of the major NDDs with the progressive deterioration of memory, learning and other cognitive functions and involves the formation of disorientated plaques, neurofibrillary masses that result in an extensive neuronal loss. Beta-amyloid peptide (Aβ) is the foremost element of senile plaques that is mainly involved in the developmental process of AD . Aggregation of Aβ leads to neuronal cell death by causing energy reduction, oxidative stress, inflammation and apoptosis . Brain sections with plaques usually demonstrate the decreased figure of synapses as well as the plaques associated neurites are normally scratched, which signifies that Aβ damages neurites and synapses. Whereas acetyl-cholinergic or glutamatergic neurons give the impression as of predominantly affected. Importantly, amyloid precursor protein (APP) outcomes as the creation and accretion of neurotoxic forms of Aβ . Aβ are generated by gamma-secretase-mediated sequential cleavages of APP and β-secretase (beta-site amyloid precursor protein cleaving enzyme, BACE) . PD involves the dopaminergic neuronal loss in substantia nigra pars compacta (SNpc) and is second most common neurodegenerative disorder. It chiefly results in the tremor, rigidity, bradyphrenia, bradykinesia, postural instability and gait impairment [11-13]. The adult hippocampal dentate gyrus (DG) receives inputs from dopaminergic neurons in SN. So, deterioration of dopaminergic neurons may directly affect adult hippocampal neurogenesis . Lewy bodies (LB) are associated with the pathology of PD and α-synuclein is the chief component of LB which become aggregated in PD . HD is a progressive neurodegenerative disorder and is documented to have the frequency of 5-10 cases per 100,000 globally. It is an inherited disease of autosomal dominant trait  which involves neuronal cell death particularly in cerebral cortex and striatum. It mitigates the life expectancy and leads to the disability of the effected subject . HD is characterized by decline in cognitive and motor ability, psychiatric disturbance, chorea, suicide risk and depression which eventually lead to death [17,18]. Onset age for HD is typically mid to late stage of life but infrequently juvenile onset is also observed . The gene which encodes for HD is huntingtin (Htt) that has variable length of polyglutamine (polyQ) tract. HD occurs due to CAG repeat expansion in Htt gene which results in the development mutant Htt protein with extended polyQ tract greater than 36Q in the N-terminus of Htt [20,21]. Stroke results in the abrupt loss in brain functioning because of cerebral blood supply disruption and are the second foremost cause of death. The symptoms usually last for at least for 24 hours or lead to the death . Stroke is an acute neurologic malfunctioning of vascular source with sudden (seconds) or may be at rapid (hours) occurrence of symptoms . Cerebral blood reduction and cerebrovascular diseases are mainly caused by embolism, focal hypoperfusion and thrombosis. At rest brain receives 20% of the blood, so it is intricately sensitive to ischemia. Even short-lived periods of ischemia to neurons can elicit a multifaceted events that may result in everlasting cerebral mutilation . Almost 45% of the ischemic strokes are instigated by thrombus in large or small artery, 20 % of strokes are embolic in derivation. When plaques are produced along the injured vessel and intima is abraded, it can results in the formation of thrombosis in intracranial arteries . The injury of the endothelial consents platelets to adhere and aggregate, then coagulation starts, and thrombus progresses at the plaque site. As a result, intracranial and extra cranial systemic blood flow decreases, and function is maintained by collateral system . Studies suggest that during cerebral ischemia there is an activation of NMDA receptor which results in accumulation of ROS resulting in oxidation of vital cellular components. This also amends the signaling pathways which then lead to cellular damage and death . Schizophrenia is a serious psychiatric disorder with symptoms of hallucinations, delusions and disorganized thinking. This is an illness with an unclear cause but the theories have suggested that demyelination of white matter is the etiology of schizophrenia . Some of the morphological brain anomalies perceived in schizophrenia patients includes loss of cortical gray matter  the minimized hippocampal volume, the amygdala, temporal, frontal lobes and enlarged ventricular regions . Schizophrenic pathophysiology involve reduced availability of ATP followed by mitochondrial dysfunction diminishing the activity of Na+/K+ ATPase maintaining the membrane potential leading to prolonged depolarization and increasing receptors activity by exuding magnesium from the N-methyl-D-aspartate receptors (NMDAR) . Several approaches have been used to manage the NDDs and most of them exerts positive efficacy by improving health status but none of them has been proved as a proper remedy . Plant derived components or phytomedicines such as alkaloids and flavonoids have been used from the ancient times against NDDS. They have been potentially proved as the most effective management and therapeutic agents to minimize the crucial aspects of NDDs such as AD, PD, stroke and schizophrenia . Phytochemicals or the phytomedicines are the bioactive plant compounds found in vegetables, fruits, grains etc. and regular intake of fruits and vegetables can reduce the risks of various diseases that cause neuronal dysfunction. There are several phytochemicals which possess neuroprotective potential and alkaloids are one of the most reliable agent against NDDs . Alkaloids are naturally occurring compounds containing carbon, hydrogen, nitrogen, and usually oxygen and are primarily found in plants, especially in certain flowering plants . A single plant species usually comprises of few kind of alkaloids but numerous families of plants such as Solanaceae (nightshades), Papaveraceae (poppies family), Ranunculaceae (buttercups) and Amaryllidaceae (amaryllis) are predominantly rich in several kinds of alkaloids . Figure 1 illustrates the role of alkaloids in a variety of NDDs. ALKALOIDS IN NEURODEGENERATIVE DISEASES. Because of the influential and multiple actions of alkaloids, they possess a variety of pharmacological potentials in modern medicine and the effects includes analgesic (e.g., morphine), anti-hyperglycemic (e.g., piperine), anticancer (e.g., berberine), antiarrhythmic (e.g., quinidine), antibacterial (e.g., ciprofloxacin). Some other alkaloids exhibit stimulant effects to CNS (e.g., cocaine, caffeine, and nicotine) as well as psychotropic effects (e.g., psilocin). Although alkaloids have an extensive history and numerous applications but only a few are promoted as active medicine . Alkaloids exert numerous neuro-protective activities in numerous diseases such as epilepsy, psychological disorders, cerebral ischemia, dementia and memory impairment, depression, anxiety, HD, PD, AD and many others . Alkaloids attenuates the development of NDDs through their vast mode of action, i.e., via inhibiting the activity of acetyl-cholinesterase (AChE) enzyme , by increasing the level of gamma-aminobutyric acid (GABA) , by acting as antagonist of NMDA  and many more as described in Fig 2. Alkaloids are divided into several classes based on their sources, pharmacokinetics and chemical structures. A variety of pharmacological implications of alkaloids in several NDDs are summarized in Table 1. 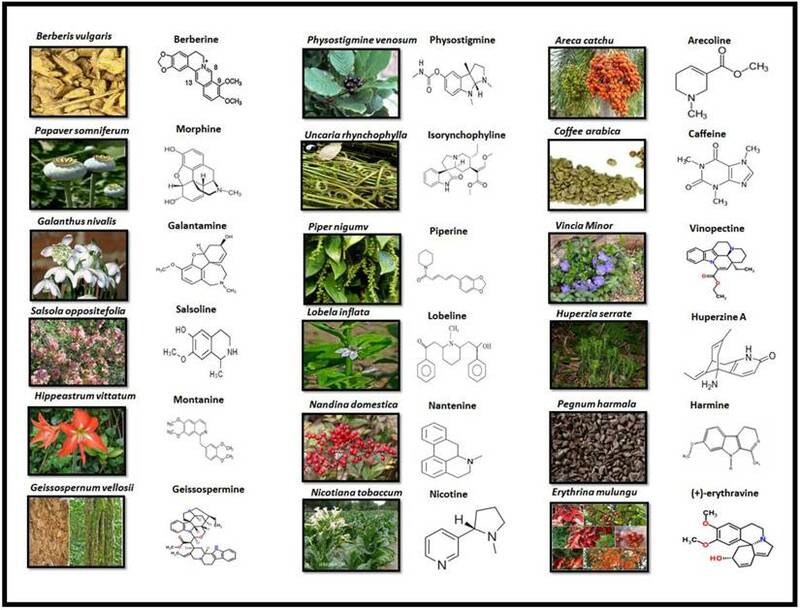 Alkaloids are elucidated with their availability within the specific part of different plants and their chemical structure in Fig 3. Berberine (BBR) belongs to the isoquinoline class of alkaloids with a bitter taste and yellow colour, having medicinal use in Ayurvedic and Chinese medicines for about 3000 years. It can be isolated from several plants including Hydrastis Canadensis (Goldenseal), Berberis vulgaris (barberry), Coptis Chinensis (copies or golden thread) and Berberis aristata (tree turmeric) . BBR has multiple pharmacological effects like anti-inflammatory, anti-hypertensive, anti-oxidant, anti-depressant, anti-cancer, anti-microbial, anti-diarrheal, cholesterol and glucose lowering properties . Studies reported that it is beneficial in a number of neuropsychiatric disorders and NDDs. It produces anxiolytic, antidepressant, anti-amnesic effects and exhibits a positive potential in the treatment of drug addiction . BBR possess therapeutic potential for diseases such as AD, PD, HD, cerebral ischemia and schizophrenia [7,65]. Studies have suggested that BBR may be of clinical significance for AD due to its potential in attenuating the Aβ . As the BACE-1 is the APP cleaving enzyme which initiates the Aβ production . BBR improved the behavioral impairment by preventing the hippocampal neurodegeneration and also reduced the activity of BACE-1 activity . Importantly, it also possesses monoamine oxidase (MAO) inhibiting property  as well as AChE inhibiting property as both are involved in the advancement of AD . Recently it has been illustrated in another literature that BBR attenuates the deposition of Aβ plaques and prevent the expression of BACE-1 . BBR enhances the motor stability and synchronization by prevention of neuronal damage of dopaminergic neurons. It also improves short-term memory by inhibiting apoptosis and improving neurogenesis in hippocampal dentate gyrus . It was found that BBR significantly prevented both balance and memory loss in PD and there was reduction in SN dopaminergic neuronal loss and decrease apoptosis in the hippocampus . Currently, HD has no effective medicational therapy, but there are some plant-derived alkaloids, which may have potent effects against this disease. It has been demonstrated that one of the possible therapeutic targets for HD is autophagy . BBR up-regulates the autophagic function , which may also beneficial for clearing misfolded proteins in case of HD because misfolding of proteins is hallmark in manifestation of HD . It has also been reported that BBR reduces mutant Htt deposits and aggregation by activation of autophagic function which improves movement coordination and motor function . Epilepsy is the neurological disorder, which is characterized by seizures. Although, several antiepileptic drugs (AEDs) are available but they affect the patients with copious side effects and numerous AEDs are seizures resistant. This enhances the interest of researchers to discover phytotherapy to attenuate events of epilepsy . Studies have suggested that extract from Berberis Vulgaris is beneficial in the treatment of epilepsy and convulsions . It has been illustrated that excitotoxicity of NMDAR is linked with pathology of epilepsy. BBR may provide therapeutic potential by averting the activation of excessive extrasynaptic NMDAR  and it has been reported that BBR modulates the neurotransmitter system and act as an antagonist of NMDAR . However, more work need to be done to explore the potential of BBR as an antagonist of NMDAR. The recommended dose of BBR in Chinese medicine is 0.2-1.0 g/day . In some studies, up to 1.5 g/day has also been recommended in clinical conditions but it may generate adverse effects on gastrointestinal tract (GIT) . There are limited reports about adverse effects of BBR on GIT which include constipation and diarrhea. Neonatal hemolytic jaundice has also been observed due to intake of BBR during pregnancy . Its adverse effects can be reduced if it is administered along with absorption enhancer because it possesses low bioavailability due to its poor intestinal invasion . Morphine is an isoquinoline alkaloid which exerts persuasive narcotic and analgesic effects and is used in the attenuation of moderately serious to extreme pain. Morphine mediates its analgesic activity through the µ-opioid receptor (MOR) [78,79]. Various experimental models revealed that morphine can exhibit advantageous role against neuronal system injuries . Morphine plays a vibrant role in AD treatment via binding to MOR in CNS which increases the levels of GABA in synapse of brain  and also provide protection from oxidative stress mediated neurotoxicity . Morphine protects against intracellular Aβ (iAβ) venomousness in primary neuronal cultures of rats and human beings. It is capable to reverse the iAβ induced electrophysiological changes including capacitance and resting membrane potential . Administration of morphine in a dose dependent way reduced the Aβ tempted neurotoxicity via activation of MOR . The significant dose for morphine is less than 200-300μg from a decade ago . The use of morphine is limited due to its side effects such as vomiting and nausea . Administration of morphine during lactation and during and before pregnancy results in pyramidal cell damage as well as impairs spatial memory . Montanine is an isoquinoline alkaloid belonging to Amaryllidaceae family which is isolated from an ornamental plant named Hippeastrum vittatum. It possesses anticonvulsant property . AChE inhibiting property of montanine in a dose dependent manner has also been reported . There are nine Amaryllidaceae species which possess AChE inhibiting properties and montanine is one of them. Montanine is found in bulbs of Hippeastrum vittatum . Studies have suggested that there is an important role of GABAergic neurotransmission in stress, anxiety, and epilepsy. GABAergic neurotransmission dysfunction has been reported in the patients of anxiety which is associated with epilepsy . It has been reported through experimental investigation that montanine protected against convulsions by modulating the neurotransmitter systems including GABAA receptors . It has been suggested that PTZ causes cognitive deficits linked with seizures . The adverse health issue which is concerned with montanine is GIT disturbance . Although no latest information has been reported regarding montanine. Salsoline is an isoquinoline alkaloid belonging to Chenopodiaceae family . The genus Salsola (Chenopodiaceae) encompasses about 120 species, which are wide- spread bushy plants, particularly in the deep grounds of the moderate and subtropical areas of several countries . It possesses neuroprotective potential against AD through its cholinesterase inhibitory action . It has been investigated that cholinergic transmission is reduced in case of AD which results in loss of cognitive function  which can be improved by AChE inhibitors . Salsoline possesses the property of inhibiting the AChE enzyme . It has been demonstrated that the AChE and BuChE inhibitors are beneficial in the treatment of AD . Studies revealed the action of three salsola species for the first time as AChE and BuChE inhibitors. Salsoline is characterized by a selective action against BuChE, thus targeting a novel approach for AD treatment . Hence, more work need to be done in this regard. Galantamine is included in isoquinoline class of alkaloids which can be secluded from various plants such as Snowflake (Leucojum aestivum), Snowdrop (Galanthus nivalis) and from Daffodil (Narcissus tazetta) as well . Russian pharmacologist for the first time used Snowdrop in the treatment of poliomyelitis. For the treatment of AD, synthetic galantamine was first recognized in 2000 in Sweden. It was successively approved in the United States and the European Union . It has been suggested that AD is caused by the imbalance in cholinergic system as well as loss of levels of ACh in the brain due to over activation of AChE which might be accountable for the decline in cognition as the neuronal excitability is regulated by ACh . This might generate the hypothesis that AChE inhibitor could ameliorate the drawbacks of AD. It has been reported that galantamine impacts on central cholinergic pathways by inhibiting AChE . As galantamine is the AChE inhibitor (AChEI), thereby it ameliorates the cholinergic neurotransmission by reducing the ACh breakdown . In another literature, it is demonstrated that it binds to the AChE in the brain which in turn increases the level of ACh in synaptic cleft by reducing the catabolism of ACh . It has also been reported that it is potentially reversible and selective AChE inhibitor and several preclinical studies were also carried out to define its pharmacokinetics . Clinical trials have proved that galantamine (24mg/d) improved the cognition/perception in the patients of slight AD with no symptoms of hepatotoxicity . Strong suggestions indicated that functional nAChR (particularly the α7 subtype) attenuation/dysfunction in AD also decreases the learning and memory by blocking of nicotinic agonists [98,99]. Galantamine allosterically modulate nAChR activity which potentiates nicotinic neurotransmission and enhance cognition and memory . Furthermore, it exhibits positive stimulation in hippocampal neurogenesis through a7 nicotinic ACh receptors . Many studies have revealed that galantamine inhibits Aβ accumulation and cytotoxicity which is also another hallmark in pathology of AD [102,103]. Galantamine also protects the neurons against oxidative damage by scavenging ROS but more work need to be done in this context . So, all above shows that galantamine may decline the neurodegenerative insults in case of AD via neurogenesis and neuroprotection. It has been reported that galantamine at the dose of 26mg/kg is very effective in ameliorating the behavioral and cognitive abilities in AD. It also delays the formation of Aβ plaque . But it has also been considered that the long term use of galantamine can significantly attenuate the mortality . The adverse side effects which are linked with the galantamine intake are GIT disturbance, vomiting and nausea [106,107]. It is an indole alkaloid belonging to Apocynaceae family which is isolated from Brazilian tree Geissospermum vellosii. It possesses strong anticholinesterase action as well as anti-inflammatory and antinociceptive properties . Aqueous infusions of its bark are frequently used by native societies for countless medicinal determinations. It is medically significant plant and exerts a round figure of medicinal potentials as anti-oxidant  as well as antibacterial and antimalarial [110,111]. As it is well-known that AChE leads to advancement of AD. It has been reported that GSP improves cholinergic transmission by its AChE inhibiting property . One of the investigation demonstrated that docking of the GSP into the dynamic place of AChE displayed particular restricting mode between particular groups of AChE residues and GSP. Some of the putative ligand/protein collaborations, for example, hydrogen bonds, and hydrophobic interactions were identified in the above complex . Hydrogen holding collaborations were identified with His440 and Ser200 that could propose the impact of catalytic triad for the AChE inhibiting mechanism through GSP which would help the sketch of new prospective Hurt preventers significant for the management of AD . Physostigmine is a pyrroloindole alkaloid which is also called eserine. It is the first natural alkaloid which was studied as AChE inhibitor . It belongs to the Leguminosae family and isolated from ripe dried seeds of Physostigma venosum . It has the ability to cross blood brain barrier (BBB) . Despite its property to cross the BBB, it has also unveiled narrow therapeutic index, short half- life and peripheral side effects . It has been reported that physostigmine improves the cognitive abilities in normal and AD patients  and also has the efficacy to inhibit BChE enzyme which is also reported in etiology of AD but inhibition of BChE may cause some adverse effects like nausea and vomiting [113,114]. Rivastigmine is reported as therapeutically successful synthetic analogue of physostigmine  possessing its advantageous clinical efficacy against AD which is recently investigated in patients of AD in Taiwan . Rivastigmine possess dual action, AChE as well as BuChE inhibiting properties which is useful in alleviating the symptoms of AD . It has been shown that α-synuclein expression increased in PD. There is a great dearth of data regarding antiparkinson effect of physostigmine. However, it was described that phenserine is a physostigmine derivative which possess the efficacy to lower the α-synuclein expression in neural cell lines . Recently, no work has been done to explore the therapeutic potential of physostigmine to attenuate the symptoms of PD. The dosage of physostigmine as 0.04 mg/kg considered to be the highest dose with no side effects . There are several side effects which are linked with the use of high dose of piperine including nausea, vomiting, diarrhea, headaches and dizziness . Some other reported adverse effects of physostigmine are enhanced blood pressure and heart rate . Isorhynchophylline (IRN) belongs to tetracyclic oxindole class of alkaloids which is extracted from Uncaria rhynchophylla, a chinese herbal medicine which is commonly used in the treatment of neural associated disorders [118,119]. It has been reported that it exert positive effects against neurological disorders such as dementia and amnesia  as well as ischemia, and epilepsy [35,121]. Japanese neurotrophic medicine called Yokukansan also includes IRN as an important component . Oxidative stress attenuates the body's antioxidant capability and enhances the level of reactive oxygen species (ROS). The brain in particular vulnerable to ROS which is also a main causative factor of abnormal aggregation of Aβ peptides that results in the progression of AD . It has been reported that a phytochemical, IRN is beneficial in the treatment of AD because of its neuroprotective efficacy against neurotoxicity caused by Aβ  by the suppression of cellular apoptosis induced by mitochondrial pathway and inhibition of oxidative stress [124,125]. Experimentation revealed that IRN treatment expressively improves the cognitive shortfalls persuaded in the rats by Aβ25-35. Furthermore, IRN down-regulate the levels of the ratio of Bcl-2/Bax of protein by reducing the Aβ25-35 tempted neuronal apoptosis in hippocampus  as the enhanced level of Bcl-2 promote the survival of altered cells and increase the apoptosis . Alpha-synuclein (α-Syn) masses are the chief constituents of Lewy bodies, which are specific pathological features in PD brain . IRN is an effective agent to treat PD  as it degrades the α-synuclein  and protects neuronal cells through the autophagy-lysosome pathway . Autophagy referred as self-eating machinery which is used to destroy and reprocess the long lived organelles and proteins for maintenance of cellular homeostasis . Piperine (PIP) is a chief alkaloid found in long pepper (Piper longum) and black pepper (Piper nigrum). It belongs to the Piperaceae family . It has been reported that piperine possesses a diversity of pharmacological effects which include anti-inflammatory, antifungal, insecticidal, antihypertensive, antipyretic, antitumor and analgesic effects as well as possess numerous neuroprotective properties such as antioxidant, antidepressant, anticonvulsant activities [132,133]. The ethanolic extract of Piper longum fruits exert anti-snake venom activities as neurotoxins present in the snake venom cause deadly effects on CNS . Studies have suggested that PIP at all dosage expressively reduced memory impairment. Conversely, it was also found that low dose of PIP is able to increase neuronal density in hippocampus. However, further studies need to be done on its neurogenesis action in hippocampus resulting in memory impairment . PIP modulates the neurotransmitter systems (serotonin, GABA, Norepinephrine) and delays the tonic-clonic seizures by elevating the cortical and hippocampal serotonin and GABA level . GABA receptors dysfunctions have been suggested to be the underlying cause of epilepsy . Electrophysiological studies revealed the basic mechanism through which PIP serves as an anti-convulsive agent because of its potential to antagonize sodium/calcium channel . Unfortunately, limited data describe the efficacy of PIP as an anti-convulsive agent. Studies need to be done to explore its potential therapeutic role for clinical medical use. PIP promotes the cognitive enhancement via inhibition of AChE and β-secretase enzymes. It has been considered that PIP might cross BBB . Administration of Piper nigum L. methanolic extract proved to be beneficial in ameliorating cognition as well as attenuating the oxidative stress in hippocampus of Aβ1-42 rat model of AD . Most recently it has been demonstrated that if PIP (20 mg/kg) is administered in combination with quercetin (20, 40 and 80 mg/kg), it enhances the neuroprotective effect of quercetin as well as attenuates the cognitive deficits and oxidative stress as in case of AD . MAOs are the mitochondrial bounded enzymes which control the concentration of neurotransmitter such as DA which depicts that they are targets for neurodegenerative disease such as PD . An important enzyme that metabolizes DA is MAO-B. It has been reported that piperine has the ability to inhibit MAO B enzyme which in turn enhance the DA level. PIP also exerts persuasive anti-depressant action which is beneficial in case of PD [50,51]. Studies revealed that PIP has the efficacy to improve the coordination and balance in 6-OHDA induced parkinsonian rats. Furthermore, it has the potency to diminish inflammatory markers, interleukin-1β (IL-1β) and tumor necrosis factor-α (TNF-α) in Parkinson's rats which are 6-OHDA-induced. . It has been reported that 330 mg/kg and 514 mg/kg are lethal doses of piperine in mice and rats respectively. 100 mg/kg dose of piperine for 7 days is suggested to be non-toxic . Lobeline is a piperidine alkaloid isolated from Lobelia inflata and exhibits neuroprotective effects . It is a lipophilic alkaloidal component of Indian tobacco . Lobeline protects dopaminergic neurons against 1-methyl-4-phenyl-1,2,3,6-tetrahydropyridine (MPTP) which decreases nigral DA . It motivates the DA reverse transportation from synaptic vesicles and inhibits the uptake of DA into synaptic vesicles through the vesicular monoamine transporter 2 communication with it . Although the lobeline exerts neuroprotective effects but it also exerts numerous adverse effects at high doses including nausea, bradycardia, tingling and oral numbness . Nantenine is an aporphine alkaloid which was first extracted from the Nandina domestica fruit . Nantenine exerts sedative and anticonvulsant effects . Calcium signaling causes hyper-excitability by calcium influx which modulate the neuronal activity . Nantenine is effective in epilepsy due to its ability to compansate neuronal hyper-excitability by decreasing calcium influx into the cell [44,144]. Nicotine is a pyridine alkaloid belonging to Solanaceae family and majorly found in Nicotiana tobaccum. It exhibits extensive pharmacological properties in central nervous system (CNS) as well as the peripheral nervous systems (PNS) mediated by the stimulation of nicotinic acetylcholine receptors (nAChRs) . Nicotine along with few of its derivatives is able to improve dopaminergic neuronal survival as well as synaptic plasticity. Moreover, It reduces neuroinflammation and oxidative stress to decrease the level of pathological condition . Cigarette smoking and tobacco usage have been reported to lower the prevalence of PD and AD . AD involves the reduction of cholinergic neurons and high affinity nAChR. Glutamate and several other excitatory amino acids induced neurotoxicity have been also associated with progression of AD . Nicotine elucidates its potential efficacy in promoting the neuroprotection in AD by significantly up regulating the α4 and α7 nAChRs level . It has been stated as to constrain the formation of Aβ-peptide by binding to α-helical structure and also improve the memory and learning mediated via neuropeptide Y (NPY1) receptors . An earlier study on animal model showed that nicotine is able to diminish AD pathology through one of its chief metabolite named as cotinine . Cotinine expresses its possessions as an alternative of nicotine and exerts potential advantageous properties against pathological mechanism of AD. Furthermore, it averts memory loss in a mouse model of AD by preventing the Aβ peptides accumulation . Despite the potential neuroprotective efficacy in NDDs, nicotine also portrays several toxicological effects . According to the standard data base and safety sheets its lethal dose is 30-60 mg for adults whereas values determined in laboratory animals ranges as 50 mg/kg in rats and 3.3 mg/kg in mice . Nicotine exerts its toxic effects through mitochondrial membrane disruption as well as by inducing the production of ROS. Furthermore, it causes the ER stress, which in turn leads to the protein degradation by activating the caspase-3 activity and finally induces the apoptosis . Arecoline is a pyridine alkaloid belonging to the family Arecaceae and chiefly found in the fruit of the palm tree Areca catechu L . It has been reported to use as masticatory throughout different parts of Southeast Asia and Indian subcontinent due to its potential therapeutic efficacy . It directly stimulates the cholinergic activity and also elucidates the potential stimulation of CNS by binding to the M2 muscarinic receptors . Several scientific studies have been conducted on Areca nut which indicates its several pharmacological effects like anti-inflammatory, analgesic, and antioxidant effects and anti-schizophrenic . Communally, arecoline is a potential agent for treating some CNS disorders due to its efficacy to cross BBB . It has been proposed that Oligodendrocytes (OLs) majorly play a significant role in the schizophrenia pathogenesis . Arecoline is reported as a partial agonist of acetylcholine muscarinic receptor which is assumed to exert favorable effects against the schizophrenic symptoms . Arecoline possess its efficacy against schizophrenia by directly targeting the OLs and also prevents the demyelination of white matter. It enhances the social and cognitive activity as well as protects the myelin damage in cortex by facilitating oligodendrocyte precursor cells (OPC) differentiation through dephosphorylating the activated protein kinase AMPKα . Five subtypes (M1-M5) of muscarinic receptor are widely distributed in the CNS which are chiefly involved in a vast variety of functions including nociception, cognition and movement regulation . Some of the earlier studies reported that a significant decrease of M1 and M4 receptors expression in schizophrenic patients with in various regions of brain such as hippocampus , prefrontal cortices , anterior and posterior cingulate cortex and superior temporal gyrus . Arecoline exerts its potential efficacy against schizophrenia by promoting the body excitability through muscarinic receptors (M receptors) stimulation as well as expand memory and learning abilities . As it is comprehensively mentioned that arecoline exerts potential benefits in NDDs. Minimum lethal dose of arecoline in animal models of horses, dogs and mice has been accounted as 1.4, 5 and 100 mg/kg respectively . It also exerts inflammatory response at the dose of 0.1 mM by producing and releasing the cytokines including prostaglandin E2 and IL-6 . In an experimental study at mature mice model it tends to facilitates the production of ROS at the intra peritoneal dose of 10 mg/kg . Furthermore, it also exerts cytotoxic effects in neuronal, myoblasts and endothelial cells at the dose of 50 μM, 40μM, and 111 μg/mL in vitro [164,165]. Caffeine is a methylxanthine derivative which is isolated from coffea arabica plant and has been extensively consumed as psychoactive substance, being primarily disbursed in soft drinks, tea and coffee . Its brain stimulation activity primarily involved increased cortical activity, metabolism of cerebral energy, extracellular levels of acetylcholine which communally results in enhanced alertness . A study on animal model revealed that it possesses the ability to reverse the neurotoxicity by acting as antagonist of adenosine receptor . Furthermore, it may able to stimulate the behavioral functions like vigilance, attention, mood, and arousal. Caffeine also exhibits anti-oxidative and anti-inflammatory effects . One of the recent studies reports that coffee consumption reduces the risk of AD and PD development . Mutation in presenilins 1 and 2 encoding genes causes alteration in the activity of γ-secretase and produce Aβ42 isoform in case of AD . Caffeine reduced the Aβ deposition in cortex and hippocampus and suppresses the level of presinilin-1 (PS1), β- secretase . As the Caffeine exerts a potential efficacy to act as antagonist of adenosine receptor, thus it potentially reduces neurotoxicity in trial models of AD . Normally microtubules are stabilized by the association of an axonal protein named as tau, whereas misfolding, aggregation as well as abnormal phosphorylation of tau leads to neuronal cell death via the formation of neurofibrillary tangle . Caffeine exerts expressive efficacy to reduce tau phosphorylation in hippocampus and the corresponding proteolytic tau fragments . It also protects the basal forebrain neurons and cerebellar granule neurons from neurotoxicity triggered by Aβ . Daily consumption of caffeine at the dose of 300-400 mg  in tea, coffee and soft drinks have been reported to reduce cognitive impairment as well as the risk of AD development because of its psycho-stimulant possessions . Adenosine A2 receptor regulation has been concerned with the modulation of the pro-inflammatory or anti-inflammatory responses and is able to attenuate the locomotor dysfunction as well as tissue damage. Excitotoxicity induced neuronal death can be attenuated by blocking the A2 receptor pharmacologically. Caffeine portrays its activity as adenosine A2 receptor antagonist which results in enhanced loco motor activity in Parkinsonism . An augmented number of activated microglial cells had constantly been described in neuro-inflammatory development of PD. The activated microglial cells portray a deleterious influence on dopaminergic neurons . Caffeine has been stated to hold an ability of influencing dopaminergic neurotransmission as well as to attenuate neuronal cell death. Furthermore, it mediates dopamine receptor arbitrated behavioral responses, such as cognitive and locomotion functions . It directs the down-regulation of adenosine A2 receptors to counter the suppressive effect of adenosine on brain dopaminergic transmission . Hence it is stated that caffeine attenuates the pathological progressions of Parkinsonism via different mode of actions as mentioned earlier. Vinpocetine is an alkaloid which is extracted from Vinca minor or commonly known as periwinkle plant . It was originally marketed under the trade name as Cavinton in 1978. Since the time, it has widely been used in the improvement of cognitive impairment in the conditions such as AD, stroke, memory disturbance as well as in the treatment of cerebrovascular disorders . Its biological activities include an increase in blood flow, glucose uptake, improvement in microcirculation, reduction in platelets accumulation . Its advantageous clinical outcome is based on its varied range of action such as anti-inflammatory, anti-oxidant, vasodilation and neuro-protective agent via different underlying mechanisms.one of the underlying mechanism of its vasodilation activity involves the enhanced glucose and oxygen uptake as well as elevated production of neuronal ATP . After ischemic stroke restoration of blood flow to the brain prevents additional widespread impairment but can lead to the reperfusion injury. The inflammatory reaction accounts for one of the many features involved in cerebral ischemia reperfusion damage . A protein complex known as necrosis factor-kappa Bis (NF-κB) is majorly involved in the continuation and amplification (cascade outcome) of the inflammatory response . Activated NF-κB stimulate other proteins like RNA polymerase as well as co-activators to enhance transcription of mRNA. Thus Vinpocetine efficiently exerts a potential to induce a wide range of cell factors like chemokine's and cytokines leading to the further activation of NF-κB . It halts the inflammatory response via defeating the NF-κB movement from the cytoplasm to the nucleus. Thus it diminishes the volume of cerebral infarction via delaying necrosis and ultimately act as anti- inflammatory agent . It has long been used in ischemic stroke patients due to its potential efficacy to cross BBB and potentially inhibit the Ca2+/calmodulin-dependent phosphodiesterase-1 and voltage-dependent Na+ channels . The effective dose of vinpocetine against ischemia has been reported as (10 mg/kg) via intraperitoneal injection . It appears to be probably harmless and even no substantial destructive possessions were reported in a study of people with AD one year treatment at the dose of 60 mg per day. On contrary some of the side effects of vinpocetine include nausea, stomach pain, headache, nervousness, flushing of face and weakened immune system [175,180]. Huperzine A is extracted from Chinese herb named Huperzia serrate which is commonly known as club moss and has been used for centuries to treat the inflammation, swelling, strains and fever . It also potentially improves the cognitive function by increasing ACh levels in the brain  due to an efficacy to act as a natural inhibitor of AChE . Its neuro-protective mechanism of action is similar to donepezil and galantamine  but it parades effective penetration to the BBB, higher oral bioavailability as well as longer duration of action . Different strategies have been done to develop the alternative sources of huperzine A because it occurs in slow growing members of Huperziaceae. This includes Phlegmariurus aquarrosus in vitro tissue culture  and extraction from endophytic fungi which is secluded from huperzine A manufacturing herb [184,185]. 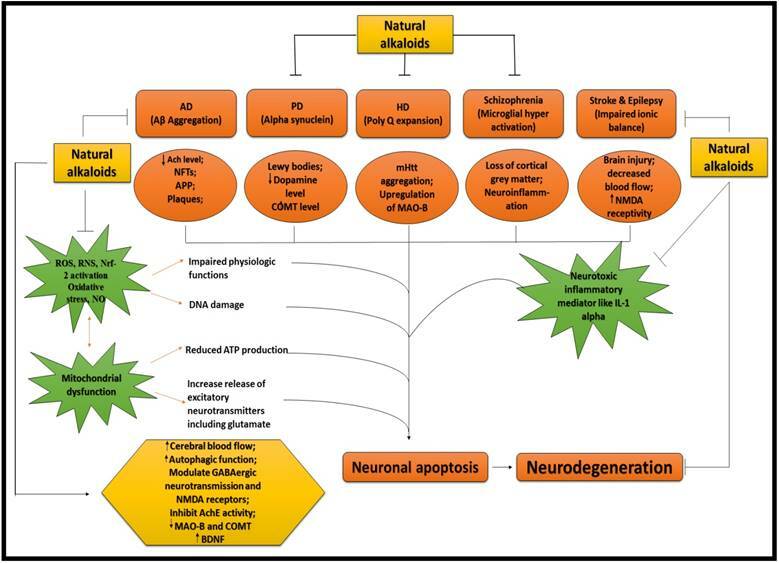 Huperzine A ameliorates the pathogenesis of AD through its neuro-protective property which majorly involves the mitochondrial protection from Aβ aggregation induced toxicity. In vitro as well as in vivo studies revealed that it acts as an inhibitor of Aβ and thus protects the mitochondrial damage to attenuate the oxidative stress . The chronology of Aβ induced neuron functional impairment is not utterly understood. However, a number of indications propose that Aβ causes extra-synaptic space glutamate level elevation that consequences in ligand gated excitatory ion channels NMDARs overstimulation and finally leading to cell death as well as synaptic loss [186,187]. Huperzine A reduces the glutamate excite-toxicity via acting as NMDA receptor antagonist and minimize the level of synaptic loss along with neuronal cell death . As the brain derived neurotropic factor (BDNF) is crucially important in memory and learning process, because it regulates synaptic plasticity, neuronal differentiation, axonal sprouting, as well as long-term potentiation (LTP) . It has been revealed by voluminous number of studies that there is a reduced or diminished level of BDNF in patients with AD as well as with mild cognitive impairment (MCI) . Huperzine A potentially exerts neuroprotection activity via signaling and promoting the production of BDNF and pro- BDNF to minimize the cognitive deficits and learning impairment induced by reduced level of BDNF . Due to the potential neuroprotection possessions of huperzine A there is a need of further research to consider it as a drug for the treatment of AD. Although huperzine A has been stated as a potential fighter of cognitive decline but it could be a lethal agent at high dose. Studies clarified its lethal dose as >4mg/kg of bodyweight and even 3mg/kg for longer period like180 days in male rats whereas 1mg/kg dose has been postulated as lethal for female rats as 2-4mg/kg of bodyweight . Harmine is an indole β-carboline belonging to Nitrariaceae family which is isolated from Peganum harmala. It has a wide spectrum of pharmacological activities including antioxidant, antimicrobial, anti-inflammatory and neuro-protective properties . It portrays neuro protective efficacy because of AChE, MAO-A and MAO-B  and tyrosine- phosphorylation regulated kinase (DYRK1A) inhibition . AChE existence majorly contributes in the pathogenesis of AD which is more often associated with the formation of neurofibrillary tangles and Aβ plaques . Harmine has been reported to target the pathogenesis of AD because of its efficacy to potentially penetrate the BBB, the parenchyma cells of brain as well as constrain the activity of AChE  which is the key enzyme involved in the metabolism and breakdown of a neurotransmitter known as ACh . An experimental study suggested that harmine at the dose of 20 mg/kg could efficiently augment spatial cognition as well as amend compromised memory via cholinergic neurotransmission improvement . Another pathological feature in AD is the aggregation and accumulation of tau proteins as well as the overexpression of brain proliferative agent named as tyrosine-phosphorylation regulated kinase (DYRK1A) . Harmine facilitates the brain development and proliferation via inhibiting the DYRK1A  as well as to significantly condense the tau protein phosphorylation via inhibiting the DYRK1A-catalyzed phosphorylation of tau. These findings suggested that harmine may have auspicious satisfying assistances in the treatment of AD . Harmine tends to exhibit cytotoxic effects at certain doses in human skin keratinocytes. Experimental concentration of harmine and the percentage level of cytotoxicity in keratinocytes have been elucidated as 10, 30, 60 and 100 µg/ml cause 19.0, 12.5, 11.7 and 11.0 % cytotoxicity. It may interact with DNA topoisomerase due to the presence of methoxyl group and results in the cytotoxicity . (+)-erythravine and (+)-11-α-hydroxyerythravine are the erythrine byproducts which are isolated from Erythrina mulungu flowers, commonly recognized as mulungu. It is chiefly found in several tropical regions and Brazilian cerrados . Several parts including bark, fruits, seeds and flowers have been used to treat central nervous system (CNS) disorders and insomnia. It exerts anti-inflammatory effects, antinociceptive [197,198], sedative, hypotonic, analgesic  and anticonvulsant effects . Alterations in excitatory and inhibitory neurotransmitter pathways are major underlying mechanism involved in the onset as well as the conservation of epileptic seizures. Erythrine by products reduce the acetylcholine evoked currents by acting as an antagonist of neuronal nicotinic receptors . Anticonvulsant possessions of (+)-erythravine and (+)-11-α-hydroxyerythravine have been reported to inhibit the seizures induced by phenyl tetrazole (PTZ), kainic acid and bicuculline, NMDA and kainic acid respectively. Both are efficiently absorbed in the GIT and also able to cross the BBB, which is crucially relevant to the advancement of new drugs directing the CNS, as well as anti- leptic drugs . There are several drugs, which have been used for NDDs till date, but they do not possess the efficacy to amend the disease progression, rather they exert copious side effects. Frequent disease amending strategies have been discovered in the recent years and numerous compounds are being explored under these strategies but none of them have successfully grasped the market. In this perspective, plant grounded drugs have also developed as an innovative acumen. Numerous natural alkaloids retain mounting effects in the treatment of several NDDs. Along with modulating neurotransmitter system, natural alkaloids also possess anti-amyloid, anti-inflammatory, and antioxidant properties as well as anti-depressive and anti-convulsing efficacy. Thus, natural alkaloids possess multiple mechanistic approaches in the treatment of NDDs. Alkaloids exert vast neuroprotective actions, but studies are needed on their toxic effects. There are few alkaloids which have been published with their toxic effects. Although many of the alkaloids with their adverse effects need to be reported. It has been suggested that the selection of natural alkaloids in the treatment of NDDs is safe as compared to synthetic drug. Numerous alkaloids and their derivatives have marvelous scope in the treatment of NDDs. But only few of them have prevalent clinical use. There is a vital requirement to design clinical trials for such compounds that are not even entered in the clinical trials till date, because the natural alkaloids are encouraging hope in slowing the development and progression of NDDs. This study was supported by the Ministry of Science and Technology (2016YFE0128500), Jilin Provincial Science & Technology Department (20170204009YY, 20150101187JC, 20150414007GH), Changchun Science & Technology Department (17YJ006, 17YJ001), Jilin Province Development and Reform Commission (2016C047-3, 2016C048-3), Jilin Province Education Department (2015-526, 2015-551), University S & T Innovation Platform of Jilin Province for Economic Fungi (#2014B-1). National Natural Science Foundation of China (No. 30871301, 30700827), and the Program for Introducing Talents to Universities (No. B07017). 61. Yadav M, Parle M, Sharma N, Ghimire K, Khare N. Role of Bioactive Phytoconstituents from Several Traditional Herbs as Natural Neuroprotective Agents Role of Bioactive Phytoconstituents from Several Traditional Herbs as Natural Neuroprotective Agents. 2016;(August). 150. Kim BG, Jee ÆSW, Lee ÆSH, Sin ÆJS, Bae ÆCJ, Lee BC. et al. Nicotine Leads to Improvements in Behavioral Impairment and an Increase in the Nicotine Acetylcholine Receptor in Transgenic Mice. 2008;1783-8. 154. Bhat SK, Ashwin D, Sarpangala M. Contamination and Adulteration in Arecanut ( Areca Catechu L.) And Its Chewing Foms : The Less Focused Subject by Health Researchers. 2017;11(1):7-12. 181. National Toxicology Program. Chemical Information Review Document for Vinpocetine. 2013;(42971):260. 190. Budni J, Bellettini-santos T, Mina F, Garcez ML. The involvement of BDNF, NGF and GDNF in aging and Alzheimer â€TM s disease. 2016;6(5):331-41. 197. Chinwala Y, Bax L, Gallego A, Krishna K, Wright W. under the supervision of. 2016.